If you have a volcano in your yard, make sure you tell your neighbours! I saw this posted over on the Tiki Central forums and just had to share it. Choptop who hails from California had an interesting incident recently. The moral of the story is, if you have a volcano in your yard, make sure you tell your neighbours! So here I am, enjoying a glass of Sierra Vista Wineries finest Cab, tending to a thick rib eye cooking slowly over mesquite and apple wood chips, listening to back episodes of The Quiet Village Podcast, all of the tiki torches in the backyard are lit and Mt. Ubangee is happily chugging away putting out puffs of theatrical fogger smoke every couple of minutes. The wind is still and the smoke from the volcano is hanging in the air above the mouth of mystic Mt. 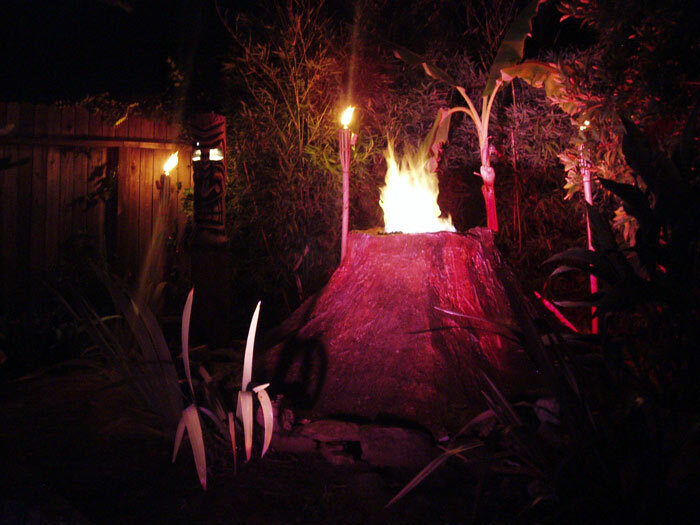 Ubangee nicely in the fading light, the red spot light in the volcano and the flickering tiki torches are making the smoke look spooky and realistic… all is well in my tiki paradise backyard…. until I hear sirens and notice flashing red lights reflecting off the neighboring house. The unmistakable sound of a structure truck diesel engine and its attending fireman echo across the roof of my house to the tranquil oasis I’ve constructed out back. I really didnt think toooo much about it at first. Then thinking of a couple of my elderly neighbors, I took a stroll out front to see if any of them were the center of all this First Responder attention. I opened my front door to find 4 firemen in full turn out gear peering over my side fence. Huh… I wonder what they are looking at? I walked up behind them with a “whatcha guys looking at? Is it anything COOL?” sort of attitude. Then I notice, hey… when you look at it just right from across the street, the smoke is carrying the flickering light from the tiki torches and the spot light a good 50-60 feet in the air. WOW, that looks pretty COOL!!!! It almost looks like there is a volcano in my back yard…. OR… it looks like the backyard is on fire…. huh… uh oooohhhhh!!!! So in short, if you have a volcano in your backyard, let your neighbors know. Invite them over for a cocktail and show off your tribute to Pele, lest you end up showing off your tectonic wonder to the brave men and women of you local fire dept. If you’d like to see some construction pics of Choptop’s volcano (pictured above), click here.